It is sad to say...but today is our last day in our StencilGirl/Xyron Blog Hop. We have truly enjoyed playing along with the girls at Xyron and hope to meet up with them again soon! Today we have StencilGirl herself Mary Beth Shaw and Julie Snidle, our newest Creative Team member and artist who shares a studio with Mary Beth. to celebrate our week with Xyron! Mary Beth made us a piece of art that just screams "playful" to me. Want to see how she did it? Check out her blog! Julie had so much fun watching Mary Beth in the studio playing with the Xyron products that she decided to play along! Check out Julie's new blog to see her project! Please remember to check out the Xyron Blog to see what they did with StencilGirl stencils! Today we are giving away BOTH of Mary Beth Shaw's books! Just leave a comment below giving us some feedback on our week long Blog Hop with Xyron. you can even sign-up to get a email in your inbox everytime we post by signing up on the right hand side of our blog under "follow us by email"! You will have until Monday, October 21st at 11:59 PM Central Time to leave your comment. We will announce the winner on our Facebook Page on Wednesday, October 23rd. Xyron for a great week! LOVE both of these!!! Loving the colors in Mary Beth's.....hope she is not offended if I say that it reminds me of a lovely jellyfish! 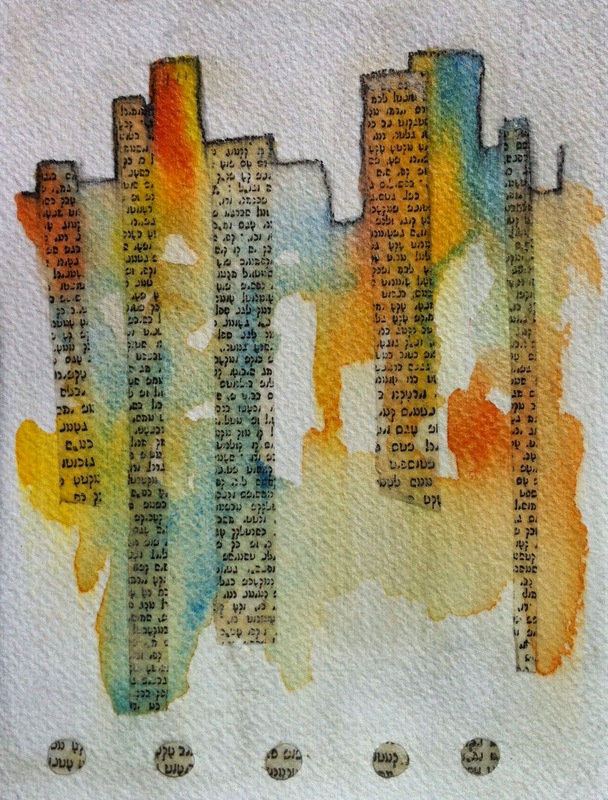 Julie's reminds me of a cityscape bathed in sunlight and shadow. Gorgeous, both of them! oh My!!!! WOW!! Both projects are absolutely stunning! I now follow on Pinterest and Bloglovin'! Beautiful projects. I love the ethereal look they each have, but in distinct ways. I'm on my way to their blogs now! omgosh! I too thought beautiful jellyfish! great pieces by both! Please Please please! count me in Maria! and Thank You! Thanks for the hop. The projects were great. I wouldn't have thought to use Xyron products with stencils! I agree with liberal sprinkles. Xyron products with stencils equals genius! I love, love, love the projects featured here. Followed on Facebook, Pinterest, and BlogLovin'. I follow on all possible venues. I love Stencil Girls and all the artists. Thanks for putting together the blog hop. It's been a lot of fun. Love all the creativity - inspired to create! Loved the projects! While I've used stencils forever, it never occurred to me to combine them with Xyron products...brilliant! thanks! Great transformation and a lot of avenues to explore! Stencil Girl and Xyron make a Great Couple! I love all of Stencil Girl stencils - it would be tough to pick just 2. And I would love Mary Beths books. Thank you for the opportunity. Love all of the Awesome projects this week . I have just started trying mixed media and this week has really inspired me . Thank you and Xyron . Blog hops are always fun... and giveaways are certainly great!! Thanks. This was an enlightening hop! loved it. I enjoyed all of the projects posted this week- gave me some great ideas! I'd never used stencils in my art before, but now I see a bunch I must have! you all are stencil girl wonders! and the inspiration is non-stop, which is what i love. keep up the great play action! and thank you, thank you... for a sweet offering! i love getting your emails, and on follow on facebook... and in my blog roll on my own blog! sweet deal! A fabulous week showcasing beautiful projects, love all these products. Thanks for a chance to win too!! Wow.. These are Beautiful. I love how fun they are. This is the kind of playing I like to do. This week has been great. I love all the idea's and projects. Now I need to get stencils to play with. Thanks for all the inspiration this week. These are the top, but the whole StencilGirl/Xyron Blog Hop was very inspirational! Thanks! The blog hop has been fun and instructional! I had no idea how I might use the Xyron products in my art until these posts. I looked at them in the shops, but didn't quite know what to do with them. Now I have many ideas! Thanks for doing this and the giveaway! I love both these projects! Julie is new to me - I'm off to check out her blog now! I loved this week's blog hop. Soo many great ideas to add to my bucket list. Life is too short! A particularly great hop. I've learned so many new techniques...all so easy. It seems that Xyron is adhesive to end all adhesives. I need some tape to make my own washi. I enjoyed following this week's Blog Hop....super ideas & beautiful projects. And excited about this next giveaway too!! I win, I will win, I will win, is a fantastic prize! I follow them on FB, Blogovin and Pinterest! I am following everywhere! Following - not stalking:):) Love the inspiration, ideas and things for me to try!!! A great giveaway. It would really fuel my creative ideas. The projects today are very free-form and very striking. I've seen so many great ideas but the one that really sticks out is the shadow box with the elephant. I have a "thing" about elephants so it caught my attention immediately. thanks for having the hop. This is absolutely beautiful!!! I follow everywhere you are!Thanks for the chance! I am new to blog hops but I have really enjoyed it! Thanks for all the inspiration and hope you're doing this again soon. Really enjoying the blog hops and the inspiration using the xyron products - so many ways! I am a new follower and club member - so excited! Wow, what a great giveaway. Would love to win, so thanks for the chance. The Xyron blog hops were great. Very inspiring to see all the different uses and techniques blended together. The blog hop was so much fun and educational. I especially liked seeing how to put the Zyron strip to the back of paper and making custom tape...awesome. Thanks for the chance to win this great prize. Love, LOVE your blog hops and your giveaways! Thanks for the opportunity to win! Beautiful projects! Thanks for the week of great inspiration! Wow! What an awesome prize! I love stencils, and wish I had more. These books look amazing too! I would love to win. What a great couple of days it was. I adore your stencils and have many ideas what I could do with them :), I am always looking for stencils now when my studio is full of papers and stamps etc. I will follow you on all places I visit, regards!!! What a fun and inspiring hop this week! Most days, I ran to my craft room as soon as I was done so I could try out the new things I learned! So many beautiful and creative projects! Love your stencils and will be buying some (all) of them as soon as the budget allows! Would be honored and thrilled to win both of these books and the 2 stencils! Thank you for the chance to win them and learn even more new techniques for using my stencils! What a inspirational site. Enjoying all the creativity that is shared here. I hope to be a winner of your fabulous prize give-away! I now follow you on Pinterest. would really love to win this great giveaway!!! I was so happy to get to be a part of this hop. I am now hooked on your great stencils. Your team did an amazing job! I loved doing the swap with Stencil Girl, what an awesome week. I must admit I ordered more Stencil Girl stencils because I just loved working with them and Xyron. Of course I'm following you everywhere I can and look forward to working with your beautiful stencils more in the future. Thanks for a great week!!! Wonderful projects! What a great week! Glad to have found you guys! Love the blog and am having fun following when I can. Great ideas. Would love to win the fabulous prize(s). Great projects along the hop this week. The book sounds fabulous. Thanks for the inspiration! I already 'like' you on FB, now following you on Pinterest & Bloglovin. Enjoyed seeing all the ways stencils could be used creatively. Thanks for all the projects and your giveaway. Love your blog hops and your stencils are awesome!! Such talented designers!! LOVE your variety of stencil designs! Great artist selection. Thank you for sharing the inspiration and a chance to win. I am addicted to Stencil Girl stencils. I believe the best artists and stencils anywhere. I just joined the club and couldn't be more excited to get these great stencils in the mail. thanks!! Was so fun being part of this blog hop! It was a wonderful week full of inspiration by my StencilGirl Creative Teammates and the Xyron Creative Team! I just discovered you and I am glad I did. The two creations above are just great. I have always loved stencils. I did take time to do some window shopping in your shop. Great stencils. I did like you on FB. I have always loved Xyron and now another place to shop and play. 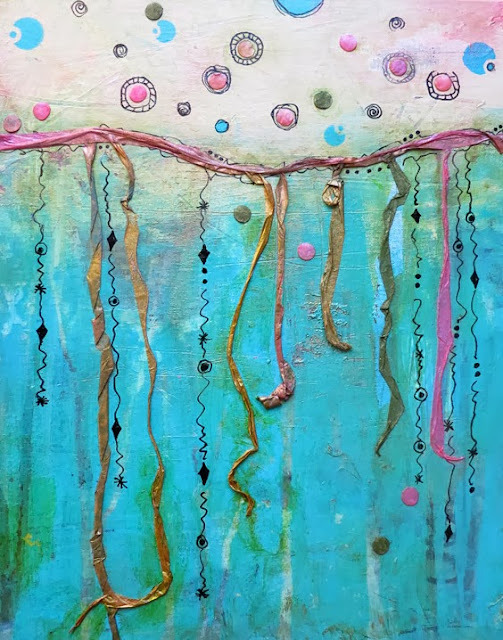 OOPS - forgot to say that I really appreciate the tutorials and handy hints shared by your DT on their blogs during the hop too - I feel so much more confident in dropping my ruler and taking the leap into the exciting world of mixed media - THANK YOU!!! Fun and happy. Great giveaway. I really need to win! What a fabulous giveaway! I love Mary Beth's art! Thanks! Your GIVEAWAY is awesome! Thanks for a chance at the wonderful goodies. Super fun bloghop! Thanks for all the great inspiration on using stencils! WoW, y'all are Give Away nuts 'round here and I for one love the chance to win'age. Love th e stencils,and projects. I've "liked" you on FB. I've been seeing stencils on the blogs but there aren't many in the stores. I'll be purchasing some of these. I'd love to have the books so I'd have some added inspiration. It's been a great blog hop. So glad you had it. Love following all your blog hops! So many ideas, so little time to play! I already like you on Facebook. And I followed your Pinterest Board. The blending of the Xyron and your stencils was very inspirational, as most of your tutorials and videos usually are. Thanks for the opportunity to win your books. Am following you on facebook and blog lovin, & pinterest. Good chance to learn new things. I'm already a follower on FB. I enjoy your blog. Thanks for the great giveaway! Wow...what great inspiration! Looove the blog hop with so many different ideas and talent! Fantastic blog hop with Xyron and Stencil girl stencils!! I've loved all the techniques on the various blogs and I'm going to borrow some of them to create on my journal! Thanks for the chance and thanks for the hop! Great projects and techniques. Thanks so much for the inspiration and the chance to win such fab prizes! Wow, that stencil really held up through "thick and thin"
Wow. Thanks for a great chance to win. I have followed you on FB for a while now. I'm a huge fan of your stencils. Thanks. Woot, woot! Liked on all three because I don't want to miss any posts! LOVE working with stencils. Love all the colors....Thanks for a chance to win and good luck to everyone! I would love to win! I'm a big fan of your products!! Wow--very colorful and creative projects. I have enjoyed this week. I love you blog thanks for the inspiration! Fabulous blog hop.... There is always something here to get my creativity flowing! So excited to have discovered you this week through xyron. What fun projects and I absolutely love your stencils. These projects are beautiful! Very inspiring! Love the idea of sharing artwork. Thank you. I found this blog through Xyron and am totally amazed at the creativity of the Stencil Girl team. I'm going to have to go back through older posts and check out the team blogs. HOPE*HOPE*HOPE to win stencils & the books. so thankful for the chance . I NEED both & all ......for carthartic artzy expression ...so i hope hope hope from plumz soapz on FB....they LOOK TERRIFIC ! 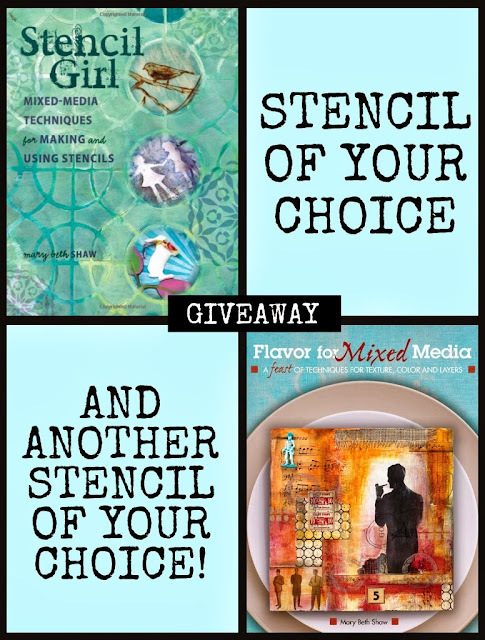 Thanks for the chance to win the books and stencils! Oh wow. They are both amazing. I love them. Thank you again for the chance to win such an amazing prize. Wonderful projects! Thanks for the chance at the giveaway. - stencils are my favorite tool ! I liked you on FB. Now I'm going to order some stencils. Looks like a fun addition to my greeting cards. Thanks for having the hop. I love your stencils! I follow you on facebook, pinterest, and bloglovin. I love your stencils, and follow you on facebook. Love the ideas from all the blogs. Pick me! OMGosh, didn't realize Mary Beth had TWO books! WOW~! Congrats! Had to take a peek at all the excitement :) Love the projects - both so very different. Enjoyed seeing all the beautiful art work! Enjoyed the projects and like the stencils. Stencils seem to be becoming popular everywhere lately. And yours are the best! I'm so inspired! I want to try these! loved the blog hop. Thanks for the inspiration!! I would love to win in your giveaway drawing for tonight!!! What beautiful creations everyone's made!! I need more stencil play time! All of the creations shared this week are outstanding (as usual) and I really enjoyed the inspiration. So cool that the xyron makes it so easy to add texture and elements. I follow you on facebook and by email... thanks.